Mr. President, Did We Miss Your Call? 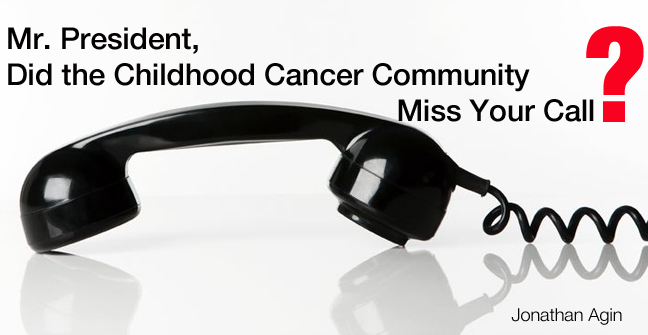 President Obama, perhaps you recall that back in January 2013 I reached out to you to talk about three specific small asks for the childhood cancer community. I know that you have had a lot on your plate recently. For obvious reasons I will choose not to delve into these issues. The other day I heard my phone ring in my office, unfortunately I could not get to it in time. Was that you trying to call me? You did not leave a message so I do not have your number to call you back. I understand from reports that the cost of your trip to Sub-Saharan Africa will cost the government approximately $60 to $100 million dollars. 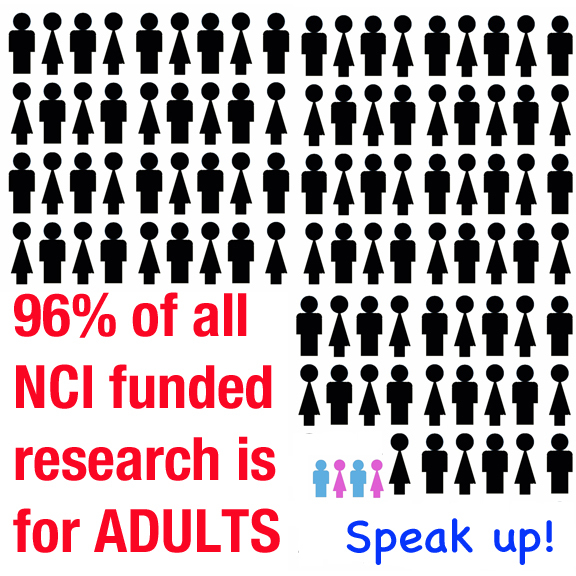 That is well over half of the federal budget for childhood cancer as allocated by the National Cancer Institute. I understand the need for foreign travel and diplomacy during a presidency; however, while you were out, many children in the United States were diagnosed with cancer and many others died from the disease. Beyond the amount that it is costing us to have you in Africa, it appears that you have expressed an intense interest in dealing with Sub-Saharan hunger. You stated “this is a moral imperative…” I wonder where you place children in your own country dying of cancer? I would love to share just five minutes of your time to see whether you would agree withe me, a father who has lost a four year-old child to cancer, that childhood cancer is a moral imperative for greater action. Seriously, do you agree with this statement? I then go back to my original letter to you. You know the one that I think you tried to call me about but I was not able to answer the phone. One of the items that I wanted to chat with you about was a petition that gained enough signatures to “Light the White House Gold” in September for Childhood Cancer Awareness Month. It seems a simple gesture considering how rapidly the White House, along with every other product under the sun, turns pink in celebration of Breast Cancer Awareness Month in October. I am quite certain that the government could afford a handful of gold light bulbs for the cause. Yet, the community has not heard a response from you whether this simple gesture is something you will make happen. Again, this is a simple five minute conversation that I would love to have with you. Mr. President, the childhood cancer community has made such amazing strides over the course of the last several years. I know that you have been exposed to children with cancer on a number of occasions throughout the course of your presidency. This is a great start. This community deserves more. We deserve a leader on the federal level willing to take that final step to call into priority childhood cancer on a level that it has never been called into before. The time is now Mr. President. You can be that leader. Bring this on as your legacy. This time when you call me, I will not miss the phone, I promise. The issues that I tried to address with you back in January are still ripe for discussion. Thank you for your time Mr. President. I am very much looking forward to speaking with you. This entry was posted in Cancer, Childhood Cancer, Pediatric Cancer, Rare Disease, Uncategorized and tagged Africa, gold, Jonathan Agin, NCI, President Obama, Whitehouse. Bookmark the permalink. 1 Response to Mr. President, Did We Miss Your Call? 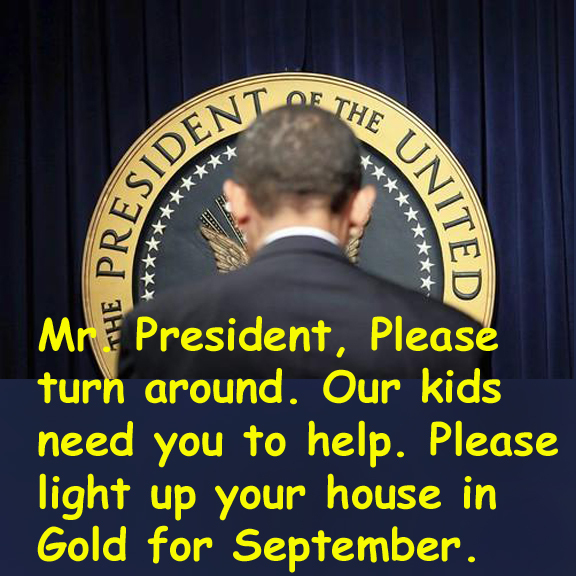 Everyone, please send letters and emails to President Obama requesting the White House Shine GOLD in September!! !